Forming online relationships can be a rewarding experience. However, the icing on the cake is when you can actually meet those cyber connections in person. Don’t know how? How about hosting a tweetup! Tweetups are informal get-togethers that are promoted via tweets. The good news is you don’t have to be a professional event planner to host a gathering; it’s actually really easy. Remember, in it's purest form, a tweetup is an open invitation to anyone in your Twitter stream who would like to attend. You never know who might RSVP, so embrace your inner adventurer! If you choose a restaurant, call in advance to be sure it can accommodate a large group and ask if it can do separate checks for your guests (lots of people at tweetups prefer to pay individually). Be sure the location you choose isn’t too loud. You’ll want everyone to be able to talk with one another. Also ask about parking options and associated costs. Most importantly, ask if the location has WiFi. If people can’t tweet during the event, you’re doomed. * To go the extra mile, actually visit the venue. Anytime you’re hosting an event, you should know as much as possible about the environment. One of the best resources to do this is Twtvite. It’s easy and it’s free. Be sure to include information that people will want to know. Are credit cards accepted? Will they need to bring cash? Does the restaurant allow for separate checks? Is there a parking lot and is validation offered? Remember, you want your guests to know all the important details that will help them arrive to your event with smiles on their faces! Twtvite will give you a link that will go to your own personal tweetup page with all the details. Tweet out the link to people in your Twitter stream and be sure to create a hashtag for your event! If you’re the host, you’ll want to be there at least 15 minutes prior to the start time to welcome people, direct them, and answer questions. Send around an attendance sheet and ask people to write down their first and last names, along with their Twitter handles. Yeah, this is old school, but not everyone has their Twitter handle on their business card. * To go the extra mile, provide your guests with name tags. It’s amazing how many people won’t recognize someone by their “real” name, yet will squeal with delight with they hear that person’s Twitter handle! Tweet out the names of those who are in attendance. This will allow your guests to see everyone else’s handles, check out their profiles or websites, and follow those whom they aren't connected with yet (remember to use your hashtag so everyone can easily see all the tweets!). * To go the extra mile, start a Twitter list and add all your attendees to it. Then tweet the list to everyone! Take photos, tweet them, and let everyone else know how much fun they’re missing! Tweet your guests to invite their feedback. Was the restaurant too expensive? Was the time too early? Would they be interested in getting together regularly? Be sure to solicit opinions so you can iron out any kinks before your next tweetup! If your first event went well, why not host another? The great thing about organizing a monthly tweetup is that you get a wonderful variety of repeat guests and newbies. Tweetups don’t have to be complicated. Don’t worry about inviting speakers or having an agenda. To be successful, all you need to do is provide a fun activity during which people can get to know one another. It can be dinner, an afternoon picnic, a trip to the local amusement park, a beach clean-up, an ultimate Frisbee game, whatever! 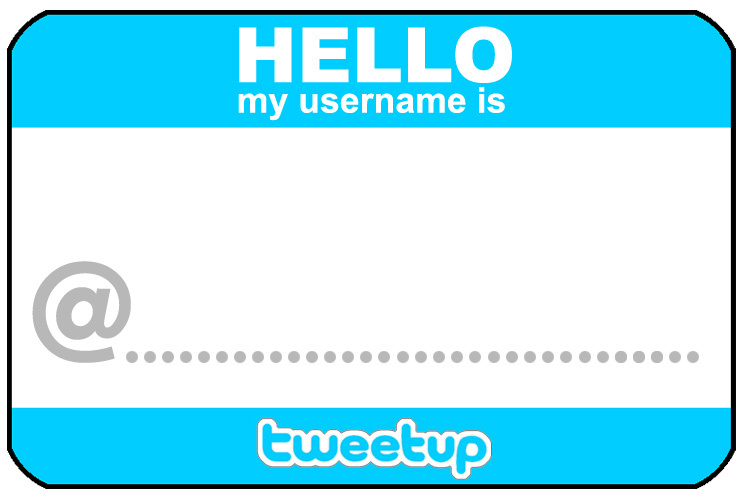 Who’s been to a tweetup? How about hosted one? What did you think of the experience? Or are you a tweetup virgin? If so, what better time than now to jump in feet first and plan one! Are you game? TweetUps are such a great way to take these online relationships that you have nurtured to the next level...there is nothing more powerful than meeting IRL. As a result of my online connections I have many new IRL friends that I feel as though I have known forever. I remember the first time I went to a TweetUp I was a little nervous...but here's an interesting thing. Most often you have engaged enough with your Twitter friends that you actually know quite a bit about them and so, when you meet IRL, it feel as though you really have "hung" with them before...the conversation, for the most part, flows very naturally. Thanks for a great post Amber with some VERY good ideas! Thanks for sharing your experiences with tweetups, Claudia! I know sometimes people are hesitant to thrust themselves into a situation where they may not know a lot of people, but my experiences with tweetups have been amazing, too. Just like my Twitter experience online, I have to say the folks who come to tweetups are generally friendly, welcoming, and really fun to spend time with. The experiences you've shared above completely mirror mine, as well. Thanks so much for the great input to the discussion, Claudia! Hope we get to meet some day! Very cool idea, Amber! I would love to meet my Tweeps in person and a Tweet Up would be a great day to do that. So, have you organized a Tweet up, Amber? Yep, I've been active on the tweetup front. Always such great people come. It's so fun to meet new folks and connect with people whom you've only chatted with online. Great Post Amber. I've searching for some hint especially how to behave. Ill be attending my first Tweet Up. I think it's a complete proof of contrary to those who say that online media and social networking has killed social capital, societal interaction. There's no way that you need to behave. Just be yourself! You're so right on the societal interaction comment. Some of my best "real life" friends are folks who I meet on Twitter. As with all things, it's what you make of it. And, tweetups are a wonderful way to further develop the relationships that start online. Have a GREAT time at your first tweetup! Very cool! Thanks for sharing your expertise with us!